Linux provides several powerful administrative tools and utilities which will help you to manage your systems effectively. If you don’t know what these tools are and how to use them, you could be spending lot of time trying to perform even the basic administrative tasks. The focus of this course is to help you understand all the basic system administration tools, which will help you to become an effective Linux system administrator. Since CentOS is based on Red Hat, all the tools and utilities mentioned in this course will also work on Red Hat 6. Module 4. User and Group Management – Every thing you need to know about user and group management including password aging. Module 5. Security – This is an important module that covers File permissions, ACL, IPTables, SELinux, OpenSSH, Tripwire, and few other security tools. Module 6. LAMP Installation and Configuration – Install and configure Apache, MySQL and PHP. Module 7. Backup and Restore – This covers all the important backup and restore utilities including tar, dump, restore, rsync, dd. Also, Bacula, the open source network based backup tool is explained in detail. Module 8. Filesystem and Store – Everything about managing your disks and partitions. Explains fdisk, parted and LVM in detail. Module 11. Networking – Explains around 14 networking related tools in detail. For example: routing, ARP, tcpdump, NFS, Postfix, SAMBA, DNS, etc. 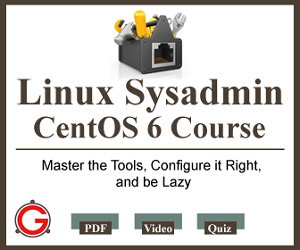 This course is for newbies or intermediate users of Linux who would like to become an expert in Linux system administration on CentOS platform. This course is for Power Users, Developers, DBAs, Network Administrators, IT Managers, or just someone who spends a significant amount of their time on Linux platform and would like to take advantage of all the Linux sysadmin utilities and perform Linux sysadmin tasks themselves. For the regular readers of TGS, I’m giving a discount, which is available until this Fri.
PS: The discount is only until this Fri. If you’ve been thinking about learning Linux System administration, and didn’t get around to learn it, use this opportunity, and don’t delay it any further. PPS: Even if you learn and implement one of the sysadmin utilities mentioned in this course in your environment (for example, Bacula for enterprise backup, or tripwire for intrusion detection, etc), it has paid way more than what this course costs you. Click here to get your access to the course NOW!.